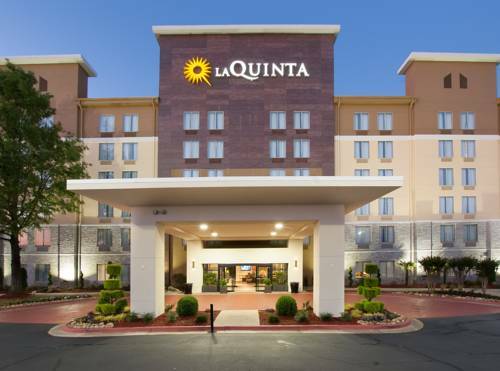 The La Quinta Inn & Suites Atlanta Airport North hotel offers a great location next to Hartsfield-Jackson Atlanta International Airport (ATL), only 2 blocks from the Interstate and only 15 minutes from Downtown, Midtown & Buckhead area. As a value driven hotel many extras are free like; Hot Breakfast items, Wireless Internet, Airport Shuttle, Local calls, Expanded HDTV & Exercise facility and feature a large outdoor pool. If you are departing from the Airport ask us about our Park, Sleep, Fly package with long term parking services. La Quinta Inn & Suites is conveniently located to some of Atlanta's greatest attractions. The worlds largest aquarium, Georgia Aquarium, is just 7-8 miles north, while there you should also visit The World of Coca-Cola, CNN Center & College Hall of Fame all about a block away. Turner Field (home of the Atlanta Braves) is only 5 miles - so come see our Braves play! Buckhead Area, Atlanta's luxurious spot for premium shopping and dining is 15 miles away while you are there you have a good chance of seeing some of our local and national celebrities. For a more cultural/historic experience you should visit; the Art District, the Fabulous Fox Theater, the MLK Center and Carter Presidential Library. For a very unique dining experience visit the New American Shakespeare Tavern - A British Pub & Grub with brews to enjoy for the UK, while you are entertained by actors in full costume of the era with various theatrical plays and sword fights!! So come visit the La Quinta Inn & Suites Atlanta Airport North and take advantage of the great adventures that the South's most exciting city has to offer! !